Here I am last week during Vacation Bible School. For the last several years (could it be over 10?) 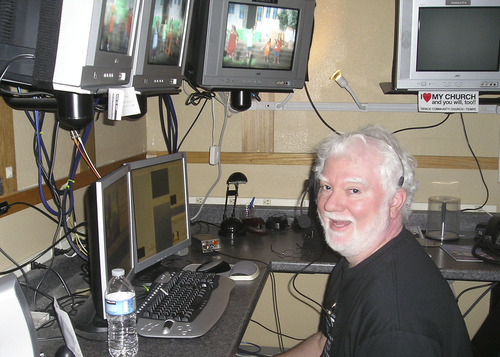 this is what I’ve been doing for VBS – running the video switcher. This is what determines what gets sent to the projectors in the worship center: the image from one of 3 cameras, song lyrics, a logo (or other graphic) or a video. I have also been doing this regularly (monthly) for the worship services over the last year. We usually have a minimum of 5 people running things each service: sound, lighting, camera remote control, lyrics switching, and video switching. Even though we have a program schedule, we always need to be ready to flex – I guess that’s what keeps it interesting. ← A True Story – long, but worth it.